Titanic.com - Titanic News, Photos, Articles & Research | Forum - Titanic news - How Far Is Too Far? I REALLY wish people wouldn't do stuff like this! I was looking for a picture (of Titanic) to use as wallpaper for my computer, when I came across THIS! I immediately started getting a sickening feeling in my stomach, which worsened when I saw their site! If this isn't insensitive then I don't know what is!! Hmm. They moved the page. Well I still found it with google. They should know better! Titanic and what happened that night isn't meant to be played with! I saw one of these at a Ford delership by my house a few years ago. Robert, try not to let it bother you. Titanic has become such a part of every aspect of our popular culture, (humor too, like it or not) that people get desensitized to the tragedy part of it. Some day in the future I fear we will see blow up world trade centers at their parties. Also, have you seen this money bank? As a money bank? no. However, I do recall seeing a fish tank ornament that was VERY much like that. 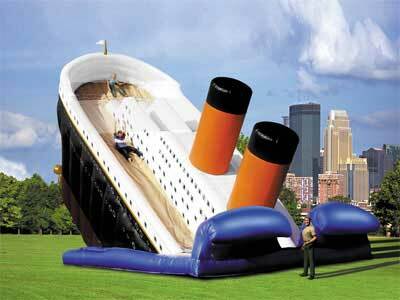 As for the inflatable twin towers at parties, I hope I don't live to see that day come. Even now, I cry whenever History Channel (or any other tv channel) has a special on the September 11 Attacks. I guess I care too much (if that's even possible).